Access your accounts at The Peoples State Bank 24/7 through your smartphone, or through text messaging. 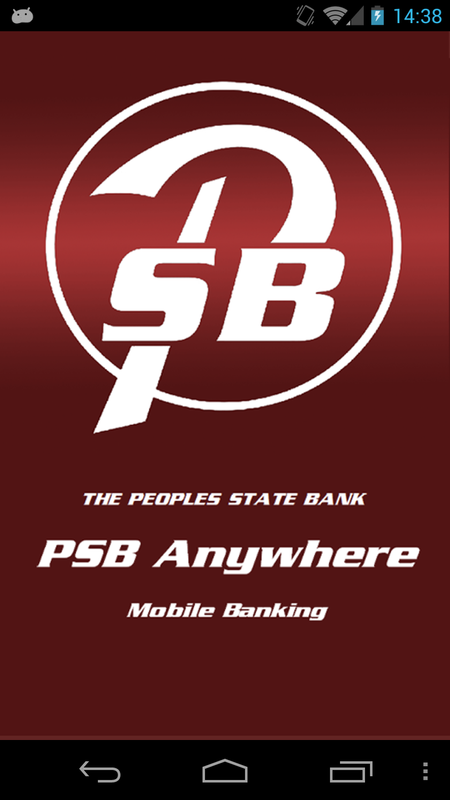 Our mobile application, PSB Anywhere lets you manage your money while you are on the go – anytime, anywhere! It’s never been easier or more convenient to – check available balances, review transaction history and search for specific transactions, transfer funds immediately between eligible PSB accounts, pay a bill, find a branch and atm, and more! NOTE: You must have an established Online Banking account prior to using our Mobile services. As of September 17th, 2018 the minimum OS versions for Android is v5 and for Apple is v9.0. Mobile web is a smaller, more condensed version of our PSB Online Banking site with access to your account via Mobile Web Banking. To enroll, login to the PSB Online Banking through your web browser, select the Options menu, and then select the Enroll Now button under Mobile Banking Profile. Follow the instructions to enroll in Mobile Browser and any other mobile services available. To enroll, login to the PSB Online Banking through your web browser, select the Options menu, and then select the Enroll Now button under Mobile Banking Profile. Follow the instructions to enroll in Text Message Banking and any other mobile services available. *The Mobile Banking App is free to download. Your mobile carrier may charge access fees depending upon your individual plan. Web access is needed to use Mobile Banking App. Check with your carrier for specific fees and charges. **Your wireless service provider’s standard texting rates will apply. ***It is highly recommended not to use public Wi-Fi (for example, at restaurants and malls) for accessing online banking or personal websites, such as webmail or social media sites. Use private Wi-Fi (for example, at your home) for those purposes. App Store is a service mark of Apple Inc. iPhone is a registered trademark of Apple Inc. Google Play and Android are trademarks of Google Inc.